Oh how I LOVED this Shrimp and Quinoa Paella Recipe!! I had recently had some traditional Spanish paella at a local restaurant, and it was sooooo good, it got the wheels turning in my head about how to create a healthier, lighter version of this popular dish. I decided to sub out the rice for quinoa, and I also bulked up the dish with more vegetables. Still using the traditional Spanish seasonings, my low calorie paella really was incredible. It was so flavorful and filling, and made an absolutely perfect Weight Watchers dinner recipe. We’ll be making this one again and again! Enjoy. 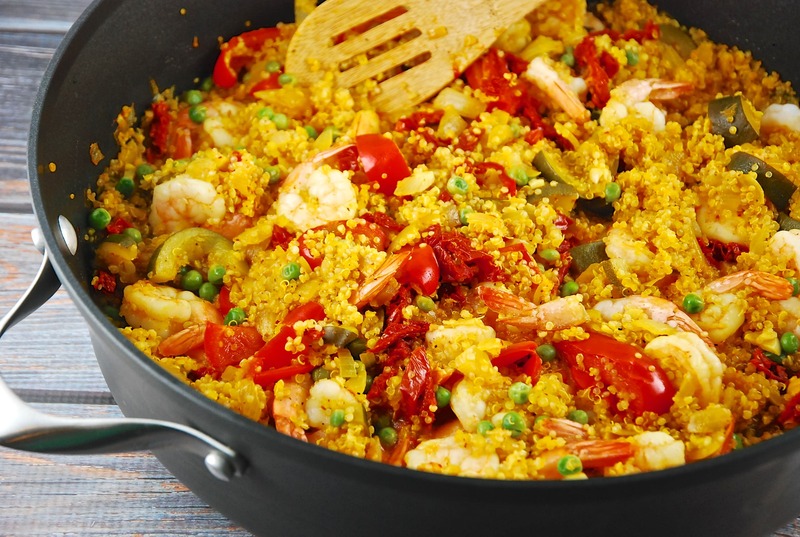 A traditional Spanish Paella recipe gets a healthy makeover in this low calorie version. Substituting quinoa for rice adds lots of protein and fiber, while still maintaing the delicious, hearty flavor. Heat oil in a large skillet over medium high heat. Add in onions and garlic, and sauté until just tender, about 2 minutes. Stir in bell pepper strips and cook for another 3-4 minutes. Add in quinoa, chicken broth, saffron (make sure to rub saffron threads together with fingertips to release the flavor when adding in), bay leaf, paprika, red pepper flakes, lemon zest, salt & pepper. Cover and bring to a boil. Reduce heat to a simmer (medium-low), and continue to cook until most of the liquid is absorbed, about 12-15 minutes. This was fantastic. Very satisfying and easy to make. Had this for dinner tonight and it was wonderful. Thank you for another great recipe. I made this recipe for my daughters birthday. This is a healthy and tasty recipe for all to enjoy. I especially like the use of Quinoa. I used the white quinoa the first time I made this recipe. I will serve this again Saturday for the Gator Football Game, using Black Quinoa. Go Gators!!!!!! This recipe is fantastic! I made it on Sunday and have happily eaten it for lunch two days in a row. So tasty and filling. Thank you! Why can’t I easily pin these recipes to Pinterest? Or am I doing something wrong. Thank you, and love your recipes.